Director and screenwriter of Italian cinema, born in Rimini on January 20, 1920 and died in Rome on October 30, 1993. Son of a trade representative and a middle-class housewife, his early years spent in the classrooms of the Liceo Giulio Cesare and between the seats of the cinema which was near his home. With 16 years started to highlight as a cartoonist, activity that allowed him, two years later, open road in Florence - in the satirical publication 420 - and in Rome, city in which he/she combined this activity with the journalist, working especially for the humorous publication Marc'Aurelio and writing scripts for radio. It was in 1939 when took contact with the film. He/She made reports at Cinecittà for Cinemagazzino magazine and wrote, along with other colleagues of the magazine Marc'Aurelio, gags for films of the time, especially in productions directed by Mario Mattoli, to immediately establish itself as co-writer of other films of Mario Bonnard, Roberto Rossellini or Goffredo Alesandrini, among others. These were years in which he/she also met Stefano Vanzini and Aldo Fabrizi and unfolded in a Roman setting that offered very different to their later work materials. He/She managed to avoid the mobilization during the war - in 1943, married Giulietta Masina- and was at the end of it when already definitely clinched his film work, collaborating with Rossellini, Alberto Lattuada and Pietro Germi. Conscious of the exceptional nature of certain characters who wandered through the Roman streets, at the time that remembering all those characters who came to his hometown with circuses that dazzled her childhood, Fellini broke with defined lines of cinematic neorealism who defended some of his contemporaries and immersed himself, from the first images in the world of the imagination, fantasy, fantasy. This is how he/she started his career as a director with the white Sheik (1952), film in which speaks of provincial environment, religion, family and honour, among other values that explicitarán attitude of the characters in his stories. But, always, within a social framework which determines them as in the useless (1953), where also emerge the cartoonish intentions that is defending Fellini from his adolescence. The ability to Fellini is consolidating through characters, of "souls" who swarm in close environments where their mediocrity flourishes and draw the profiles of the farce that life itself has become. It is as well as emerging further portraits intimate in titles such as La strada (1954) and the nights of Cabiria (1956), portraits that speak of simplicity and naivety, coarse and rude manners, deception and misery as values of survival of the different points of view, and others have about the same reality (are the looks of.) Gelsomina and Zampanó, Cabiria and Wanda and a long list of characters in the stories fellinianas). Fellini films gave off, in addition to other ghosts, real human warmth ratify the numerous awards received at international festivals and, especially, the two Oscar awarded the Academy of Hollywood the best non-English speaking films. This success was immediately confirmed by La dolce vita (1959), a tough portrait of certain lifestyles, which abound in the false appearance, empty and dazzling brilliance of the Fireworks, the consolidation of the "Pharisees" and the ephemeral existence and despair as existential absence idea, decomposition - hopeless - man. The strength of some images and representation of certain characters provoked numerous reactions both in the bosom of the Vatican and the political class; He/She went so far as to be treated social conflict caused by the film in the Italian Parliament. All this fuss did not prevent that the film was a resounding success around the world and to achieve the Golden Palm at the Cannes film festival. Frame of La dolce vita. The world of dreams, the emotional vitality of Fellini, again crossed their own limits in Fellini eight and a half (1963) film about the confusion that reigns in the personal world of Guido (Marcello Mastroianni), always wandering between reality - the filming of the film - and fiction - imagination, memory-; they are experiences that emerge from the subconscious, the lifestyle of the own Fellini. In any case seeks to internalize everything can get to, immediately, return it to others - viewers, ultimately - with a certain dose of creative coherence. The results were not to the liking of many spectators, although a vast majority of the new intelligentsia of the 1960s admired and defended this new commitment of the director of Rimini. The Hollywood Oscar best film of non-English speaking reaffirmed to Fellini in the international scene. This personal universe - the world of dreams and fantasies - the framework of learning that whole situation is for a person, returned to retrieve it in Giulietta of the spirits (1965), forward your imaginary particularly in other films of expressivity as the clowns (1970), Rome (1972) and, especially, Amarcord (1973), in which the world of the circus appears, the fascination that the city has since the provincials universe - and especially that marginal world, in an evocation of the constant of the past in the present, and the approach to a past based on anarchy adolescent of a group of young people who live their awakening to life under icons as diverse as the political leader and the eroticism that exudes the image of Gradisca. Amarcord received a Hollywood Oscar best film of non-English speaking, recognition in the amazing trajectory of Fellini in the U.S. "sphere". Topics such as the evolution of the world, the contrast of the past and the present, the reflection around how to understand times that apparently distant are coming, they are part of the column on which form the backbone of films such as Satyricon (1969), the Casanova (1976) or and the ship sails (1983), especially when it suggests and artistically represents the twilight of the universe - the culturefrom historical moments, characters and styles of life, being smart and creative-. Fellini has his characters - who inevitably accompany the spectators on a journey that always seems to be a tunnel - dream-of which nothing is known but that adventure a transit that nightmares can lead, possibly to a chaotic situation. The world of artists, entertainment, and creation, the music, the universe of marginal people, social classes in decline, not cease to form part of a thematic Repertory dominated by nostalgia, which Fellini bet from the first moment of his career, a career that featured a series of professionals who helped him consolidate his style: Ennio Flaiano, Tullio Penelli, Bernardino Zapponi and Tonino Guerra (as co-screenwriters), Otello Martelli and Giuseppe Rotunno (as directors of photography), Leo Catozzo and Ruggero Mastroianni (as editors) and, especially, Nino Rota composed the music for sixteen of his films; In addition to actors and Giulietta Masina, Marcello Mastroianni, among others. You can think about if Fellini had at some point in your life intended to go beyond their obsessions, their concerns, expand the thematic circle. Possibly, the comfort and the desire to continue with his career were arguments more solids to be love by producers and assume their economic proposals, confirming the degree of discrepancy with the moment of renewal that was taking place in European cinema and the cultural concerns that also dominated the 1950s and 1960s. No doubt these postulates made him a controversial figure. Admired by many and rejected by others, Fellini was maintained throughout his creative life immersed in their own world for some repetitive, for other offender. 1950: Luci (Co-Director) varietà. 1952: the white Sheik. 1953: A ' agenzia matrimoniale (episode of Amore in Città); The useless. 1954: La strada. 1955: Souls without conscience. 1956: Nights of Cabiria. 1959: La dolce vita. 1962: Dottor Antonio (episode of Boccaccio 70) tentazioni. 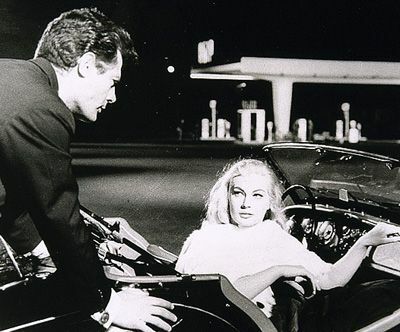 1963: Fellini eight and a half. 1965: Giulietta's spirits. 1968: Il en faut jamais parier sa tête avec le diable/Toby Dammit (episode of Histoires extraordinaires). 1969: Satyricon. 1970: The clowns (and actor). 1972: Rome (and actor). 1973: Amarcord.1976: the Casanova. 1978: Essay for Orchestra. 1979: The city of women. 1983: And the ship sails. 1985: Ginger and Fred. 1939: lo vedi as sei... lo vedi as sei? (gags). 1940: Non me lo dire (gags). 1941: pirate am I (gags); Documentary Z-3. 1942: Avanti c'e posto (and coargumento); Quarta pagina (and I coargumento); Chi l' has seen? (and coargumento). 1943: appearance; Campo de fiori; Rome, open city (and ay. address); Live... If you leave (and I coargumento). 1945: L'ebreo errante. 1946: Paisa (and ay from address). 1947: Il crime di Giovanni Episcopo (and ay. address and coargumento). 1948: no mercy (and ay. address); La Città dolente; Il mulino of Po (and ay. address); In nome della legge (and coargumento); Il miracolo (episode of love; and coargumento). 1949: Francesco, giuliare di gave (and ay from address). 1950: Il cammino della speranza; Persiane chiuse (and coargumento). 1951: A damsel in distress; The city is defended (and I coargumento). 1952: Il brigante di tacca del lupo; 51 Europe (and coargumento). 1958: Fortunella (and coargumento). ALFIERI, Carlos: Federico Fellini. Madrid. Editions Rueda. 1996. ALPERT, Hollis: Fellini: A Life. New York. Paragon. 1988. BAXTER, John: Fellini. Barcelona. Ediciones B. 1994. BONDANELLA, Peter: The Cinema of Federico Fellini. Princeton. Princeton University Press. 1992. CHANDLER, C.: I, Fellini. Barcelona. Seix Barral. 1995. FELLINI, Federico: Fellini by Fellini. Madrid. Fundamentals. 1978. KEZICH, Tullio: Fellini. Milan. Biblioteca Universale Rizzoli. 1987. PEDRAZA and Pilar López Gandia, Juan: Federico Fellini. Madrid. Chair. 1993. VILALLONGA, José Luis: Fellini. Madrid. The country / Aguilar. 1994.